What Was That Popping Noise in the Back of Your Heel? Your Achilles tendons are strong bands of fibrous tissue connecting your calf muscles to the heel bones (calcaneus). These valuable tendons play an essential role in walking and running—since they enable you to raise your heel off the ground—and are activated to at least a certain degree with almost any foot movement you make. 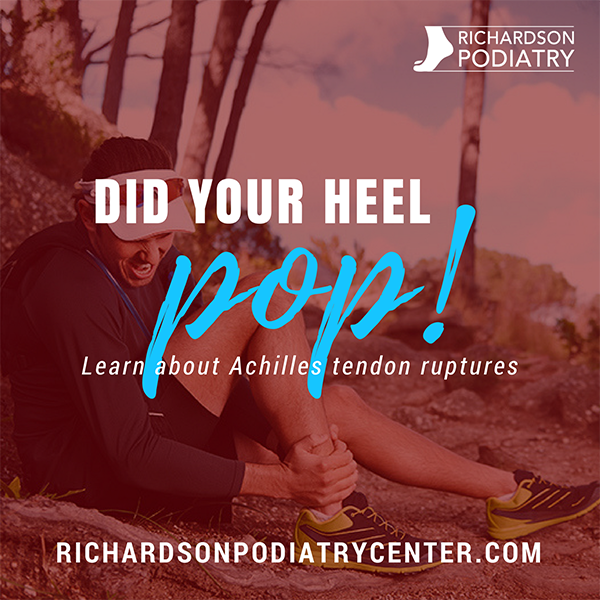 Unfortunately, if you hear a popping noise in the back of your heel, there is a decent chance you have sustained an Achilles tendon rupture. While they are durably constructed, Achilles tendons can still be injured. This is particularly true when the Achilles is overstretched due to excessive force from jumping, accelerating, or turning the foot. These kinds of injuries happen more often when people increase the intensity of workouts or athletic activity without properly conditioning their bodies. Not all cases are caused by physical activity, though. Accidents—especially falls from height—can cause the tendon to rupture. When the injury occurs, it is likely you will hear a popping or snapping noise. This will be immediately followed by a sudden, shooting pain in the area. Swelling and difficulty walking are other common symptoms of an Achilles tendon rupture. As soon as you observe any of these symptoms, it is important to seek treatment. With regards to repairing a ruptured tendon, there are two general treatment options: conservative care and surgery. Conservative treatment is a less invasive way to deal with an Achilles injury and carries fewer complication risks. The downside, though, is that it will take time for the injured tendon to repair itself, and will still need to be immobilized by a walking boot or cast. When you’re ready to start walking again, there’s a chance you may need wedge inserts to raise the heel into a better position for optimal healing. Surgical repair will typically yield faster results than conservative care, with a shorter recovery phase, slightly better overall results, and a reduction in the odds of re-injury, although some studies have shown virtually no difference between the two treatment approaches in this regard. That said, surgery for a ruptured Achilles tendon also comes with the risks of any surgical procedure, including potential infection and nerve damage. Our recommended approach to treatment will depend on the severity of the tissue damage, but this isn’t the only consideration. Generally speaking, surgical repair is more often used for younger, active patients or those who’ve suffered a significant rupture. Conservative care is more often used for less active patients and minor injuries. No matter if you choose surgery or nonsurgical treatment for your Achilles rupture, Richardson Podiatry Center will help you get back on your feet! Give our Richardson, TX podiatrist office a call at (972) 690-5374 today.